Now that Motorola’s Cyber Monday discount period is over with, they have moved on to the next solid holiday deal which is $50 off orders of at least $350 or $100 off when you spend $500 or more. If you missed out on Moto X $140 off codes yet still want a new phone, these are still pretty solid discounts. 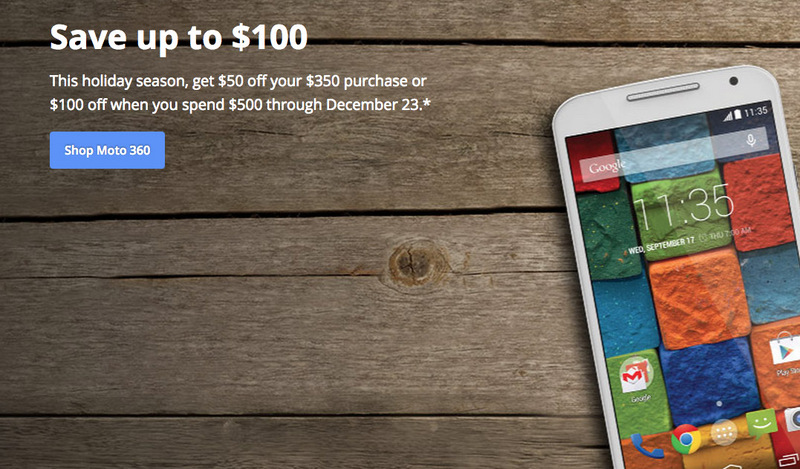 Of course, the Moto X (2nd gen) runs $499, so you can’t get the full $100 off unless you tack on an accessory too. I did find a screen protector that ran $14.95, which if purchased would get you the $100 discount and into a brand new 16GB Moto X for about $415. Keep in mind that their are exclusions, as in, these discounts do not apply to the Moto E, Nexus 6, or Moto X on Republic Wireless. The deal runs through December 23.